The murder of Colombian defender Andres Escobar in the aftermath of the 1994 World Cup cast a great shadow over football in the South American country, one which it hoped to step out at France ’98. Despite the death of drug kingpin Pablo Escobar before the 1994 tournament, the influence of mafia gangs had had a major influence on the national team and in general, political and drug-related violence continued in its aftermath. The mid-90’s in Colombia saw an escalation of the country’s armed conflict and the emergence of right-wing paramilitary death squads who clashed with existing Marxist-guerrillas led to further intensification. Colombia went in to the 1998 showpiece with the backdrop of civilian massacres at the hands of both paramilitaries and guerrillas, this extreme violence was to the forefront of many people’s minds. After what was a tragic 1994 tournament both on and off the field, manager Francisco Maturana stepped down and was replaced by his former assistant at Atletico Nacional, Hernan “Bolillo” Gomez. Despite having an aging squad, Colombia’s golden generation still remained one of the best teams on the continent and dreamed again of impressing at world football’s top table. Colombia qualified for the France ’98 by virtue of a third place finish behind Argentina and Paraguay in the CONMEBOL South American section of World Cup qualifying. Chile qualified in the final place with Brazil, as World Cup holders gaining automatic qualification without having to play qualifiers. While Colombia’s third successive World Cup qualification was heralded as a significant achievement, some expressed concern about the age profile of the squad, which had an average of 28 ahead of the tournament. “Los Cafeteros” were drawn in Group G alongside Romania, England and Tunisia as they hoped to go one better than the disastrous 1994 campaign when they failed to make it to the second phase. For the second World Cup in a row, Colombia clashed with Romania, again in the first group game at the Stade de Gerland in Lyon on June 15 hoping to avenge the surprise 3-1 defeat of their last meeting at Italia ’90. The Romanians however, had other ideas and when Adrian Lile cut in from the left-hand side just before half-time and blasted into the roof of Faryd Mondragon’s net, Colombia’s hopes of exerting revenge on the eastern-Europeans was dealt a major blow. Despite possessing the devastating attacking exploits of Carlos Valderrama, Freddy Rincon and Faustino Asprilla, the Colombians failed to fire and stumbled to a disappointing 1-0 defeat in the opener. To add to their problems, Asprilla reacted furiously after having been substituted in the 84th minute, issuing a statement the following day in which he criticized Bolillo claiming that he had “untouchables” in the starting XI, referring to Valderrama. “He disrespected me, there are other players with worse performance than me and he does not take them out,” Asprilla said to reporters. The comments by the former Newcastle United striker led to his expulsion from the squad with Bolillo refusing to accept such criticism from a player. “Here we don’t throw anyone out. People leave on their own. Asprilla made some statements that he shouldn’t have and the disciplinary regulations are there for a reason,” said the manager in reference to the expulsion. After losing the first game in disappointing fashion, Colombia went into the second match on June 22 against Tunisia needing a win to reignite hopes of qualification for the second phase. In what was an open game, Faryd Mondragon and Chokri El Ouaer were kept busy in their respective goals as both teams failed to take advantage of several guilt-edged chances to take the lead with Colombia perhaps missing the influence of Asprilla. The decisive breakthrough came in the 83rd minute however when substitute Leider Preciado fired past El Ouaer for what was the only goal of the game giving a Colombia a lifeline ahead of the final group encounter with England. Colombia went into the final game against England knowing that a win was necessary to avoid a similar fate to that of 1994, group stage elimination. Despite only needing a draw to advance, the English dominated the opening exchanges and took the lead in the 20th minute when the Colombian defense failed to deal with a Graeme Le Saux cross, leaving Darren Anderton unmarked to power the ball past Mondragon’s in the Colombia goal. David Beckham doubled England’s lead in the 29th minute when he scored a stunning 30-yard free kick to register his first international goal and condemn Colombia to defeat. It could have been worse for “La Triclor” but for a string of fine saves by Mondragon as the World Cup dream came to an end for the second successive tournament at the group stage. 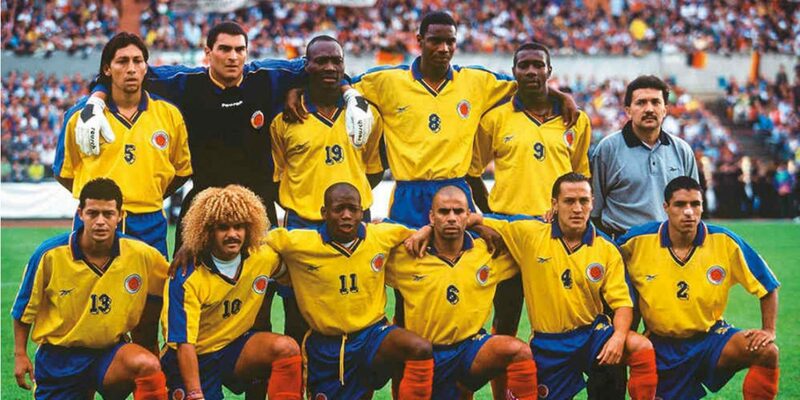 The disappointing 1998 campaign marked something of and end of an era for Colombia’s international team with the retirement of Valderrama, Adolfo “El Tren” Valencia and Anthony de Avila. The likes of Freddy Rincon and Asprilla featured again for the national side but never made it to another World Cup as Colombia began what would be a 16-year absence from the world’s most prestigious football tournament. Reflecting on what was a disappointing end to a golden age of players, striker Hamilton Ricard, who came on as a substitute against England said that division within the camp was the undoing of Colombia at France ’98. “The main problem of that Selection is that there was no unity, there was no such camaraderie that is fundamental in the groups. Everyone was in their groups. There was the group of ‘Pibe’ Valderrama, that of Faustino Asprilla, that of Freddy Rincon, and that is why failure occurred,” said Ricard to Semana magazine in advance of Brazil 2014. “After the elimination in France ’98 we ended up sad, but we did not deserve more,” conceded the retired player.